American manned Mars expedition. Study 1989. In 1989 NASA's Mars Evolution case study examined one approach to develop a permanent, largely self-sufficient Mars outpost with significant scientific research capability. Ground rules for this case study stipulated that space transfer vehicles would be assembled at a free-flying man-tended assembly fixture co-orbiting with Space Station Freedom in low Earth orbit, and aerobraking techniques would be used at both Mars and Earth. Artificial gravity would be provided in the spacecraft that transport the crew to and from Mars. A second objective was to explore the possibility of developing a "gateway" on the Martian moon, Phobos, for the production of propellant. The Mars Evolution case study was divided into three phases: emplacement, consolidation, and utilization, with each phase representing a progressively higher level of commitment, understanding, and capability. This phase would establish the initial human presence on Mars. First, a cargo vehicle carrying the initial surface habitat, construction equipment, a rover, a photovoltaic power supply, and communications equipment would be deployed to Mars. The cargo vehicle would remain in orbit, and only the unmanned semi-autonomous rover would be deployed to the prime landing site region. For several months, the rover would explore the region and identify the precise landing site for the cargo remaining in orbit during this reconnaissance period. After the cargo had landed, a crew of four would descend in the Mars excursion vehicle to the surface of Mars for 30 days. Although this first crew would live in the excursion vehicle, one objective of their short stay would be to verify the integrity of the initial surface habitat for use by later crews. Local human exploration and scientific investigation would be conducted using a pressurized rover to range tens of kilometers from the outpost, and an unmanned rover would explore within hundreds of kilometers of the outpost. A scientific payload would be robotically deployed to Phobos to reconnoiter its resources and to return a sample of Phobos to the piloted spacecraft for subsequent analysis to verify the use of Phobos as a propellant gateway. A robotic orbiter would be deployed to the other Martian moon, Deimos, for scientific exploration. The next piloted flight would bring a crew of five, who would remain on Mars for approximately 16 months, living in the habitat emplaced by the first crew. This crew's primary objectives would be to demonstrate the feasibility of long-term habitation of Mars and to conduct intensive regional scientific and exploratory investigations in the vicinity of the outpost. A pressurized rover would be provided for human exploration of scientifically interesting areas. Later in the phase, a propellant (hydrogen and oxygen) plant would be robotically delivered to Phobos. Launch and landing facilities would also be established on Mars. Significant scientific research would be performed by the second crew during the emplacement phase. Working in much the same way as geologists on Earth, they would study Martian rocks, sediments, stratigraphy, and local geomorphology, search for signs of pastor present life, determine subsurface shallow and deep structure of the planet, and observe atmospheric chemistry using balloons and rockets. Samples collected from different locations on the planet would be returned to the outpost for preliminary analysis, and then sent to Earth for further analysis. The area around the outpost would be explored to locate and evaluate local resources, such as minerals and, possibly, water. A small network of science stations would be deployed, both manually and robotically. The objectives of this phase would be to continue permanent human presence on Mars and to increase self-sufficiency from Earth. Two piloted flights would occur during consolidation. The primary tasks of the first crew of five would be to emplace and verify the Phobos propellant production plant and to conduct global exploration of Phobos to evaluate its geology and geophysics before descending to Mars for the remainder of their 18-month stay. The Phobos propellant production plant would be brought to full operational status during this time. The propellant produced would be used on the next flight. The second flight, also with a crew of five, would be a 16-month mission with the primary objective of expanding exploration and science activities on Mars. Science objectives would include farther human and rover traverses to study the planet's geology and geophysics. Plant growth experiments and human adaptation research would be initiated. Analytical laboratory facilities would be upgraded to enable experimentation with resource utilization and materials processing. The science stations would grow in number and capability to increase understanding of Martian weather, dust storms, and geophysical properties. Unmanned rover exploration capability on Mars would expand to thousands of kilometers. The objectives of the third phase would be to use local Martian resources to produce oxygen and to continue to develop operational experience living and working independently in an extraterrestrial environment. The phase would advance with the cargo delivery of an in-situ resource utilization plant and a constructible habitat capable of housing 12 people, followed by the landing of a crew of seven, who stay for 21 months. Use of the Mars outpost to perform science would continue, with emphasis on the search for indigenous life and on an expanded life sciences effort in support of plant growth experiments, experiments with microbes and animals, and additional studies of human adaptation. The Martian moon Phobos was analyzed as a possible source of hydrogen and oxygen fuel for Mars transfer and excursion vehicles to determine whether this technique could greatly reduce the amount of fuel delivered to Mars from Earth. Phobos would be in a circular orbit around Mars, whereas incoming Earth/Mars transfer vehicles would be in a highly elliptical orbit about Mars to reduce fuel requirements. The transfer vehicles would need to expend a great deal of energy (and therefore propellant) just to reach Phobos. Within the ground rules and constraints of this particular case study, the requirement for additional propellant to perform this maneuver outweighed the savings achieved by producing propellants at Phobos. However the use of local resources showed more benefit nearer the outpost, and the benefit of Phobos propellants for use in the Mars excursion vehicle required further study. Future studies could also focus on the potential for producing propellants from the Martian atmosphere or soil for use in spacecraft propulsion systems. Shortening travel time to Mars could be important. At that time, the effect that spaceflight of a year or longer had on the health of the crew was not well understood. A number of Earth/Mars trajectories were identified that would reduce one-way travel time to Mars to approximately 5 months and would also enable the crew to perform a Mars swingby maneuver in an abort situation. This swingby would propel the craft back to Earth if a problem occurred with the rocket stage that was normally used to return the crew to Earth. However, in an abort situation, the total time spent in space would be about 3 years. As specified by case study ground rules, the use of a rotating artificial gravity vehicle to transfer crew from low Earth orbit to Mars was analyzed using a hydrogen/oxygen propulsion system with an aerobrake to assist in the Mars and Earth entry portions of the trip. Both rigid and tethered artificial gravity vehicle designs had been evaluated in previous studies. For this 1989 case study, the vehicle considered had two cylindrical habitat modules that swiveled out during flight while the vehicle rotated about its central axis, creating artificial gravity for the crew. This design did not have some of the complexities associated with a tethered vehicle; however, because of its limited diameter, it could not produce the same low spin-rate, high gravity-level environment as a tethered vehicle. Therefore, if life sciences research indicated that artificial gravity was required for Mars missions, further analysis would be necessary to quantify the spin rate and gravity level required to maintain the health of the crew on long-duration flights. This research must be completed before the optimum spacecraft configuration could be determined. Several alternative propulsion systems were examined for potential improvement over the chemical/ aerobraking system stipulated as the case study ground rule. Of these systems, nuclear rockets, which appear to significantly reduce launch requirements and/or decrease trip times, were determined to be a particularly attractive option for further research. The use of the unique momentum exchange features of long tethers anchored at Phobos was a propulsion technique included in the original case study ground rules. As configured, tethers were used for both Mars landers and the piloted vehicles to provide momentum transfer from Phobos to Mars and for return to Earth. For this particular case study, the operational complexity and added mass of the tether system negated any savings. However, this technique could offer promise if the tethers were located in Mars orbit. This case study also examined the feasibility of assembling the Earth to Mars transfer vehicle at a free-flying transportation facility co-orbiting with Space Station Freedom in low Earth orbit. Although this alternative offered some advantages, such as minimizing the impact on Freedom's facilities, it required additional crew transportation and increased operational complexity. 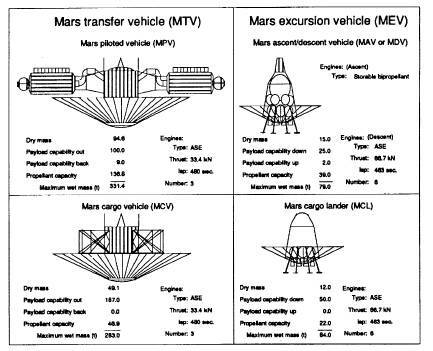 Further analysis was required, including ways to use Freedom to assemble, check out, fuel, and service Earth/Mars transfer vehicles. Space Station Freedom or a facility co-orbiting with it was also likely to be the location of a facility for life sciences research to provide the data required to make decisions regarding the gravity level and spin rate (if any) of a piloted Mars spacecraft. Another important issue involved launching the Earth/Mars transfer vehicle, its crew, and propellants from Earth to low Earth orbit. A number of launch vehicles using Space Shuttle technology, as well as configurations of the planned Advanced Launch System, were analyzed that could lift the estimated 140 metric tons per launch required to support the Mars outpost. Further studies needed to be performed to analyze how this heavy-lift capacity should be intermixed with Shuttle launches of assembly personnel and cargo. Mars was technically a more challenging target than the Moon, requiring much longer travel times, more robust engineering solutions, and more attention to complicated life sciences issues. The general goals for the exploration of Mars by humans encompassed advances in various scientific disciplines, resource utilization, and self-sufficient, permanent habitation. A wide range of implementation possibilities and mission scenario options could be selected, but it was evident that a phased program of development and learning experiences would be key to a successful outcome. The three-phase development strategy could effectively be applied to both lunar and Mars scenarios. However, unlike the Moon, where several robotic probes and 12 human explorers had already been, further research was required to resolve the many unknowns that remained concerning the Martian environment and methods of traveling to Mars. The physiological and psychological effects of long-term exposure to the zero gravity environment on the voyage to Mars and readaptation to the gravity level on its surface needed to be determined. These factors had to be understood before decisions could be made concerning Mars mission durations and the need for artificial gravity spacecraft. In addition, prior to sending human crews to the surface, robotic probes were required to thoroughly characterize the Martian environment, including the location of any hazardous substances and any valuable resources such as water. A recurring theme throughout the Mars Evolution case study was the need for advances in technology and capability. New heavy lift launch vehicles, on-orbit assembly techniques and equipment, high energy aerobraking, nuclear propulsion, and zero gravity countermeasures were only a few of the areas in which significant development was required. Investment in technology development today was essential to meet the needs of an exploration mission to Mars during the next century. Advances in life support system technologies beyond the then planned system for Space Station Freedom were also vital to the development of a largely self-sufficient Mars outpost. Because of the large distances and long trip times associated with travel to Mars and the difficulties involved in repair and resupply of replacement parts, autonomous operation and reduced complexity and maintenance were critical in the design of advanced life support systems. Because an autonomous outpost life support system would use in situ materials to supplement or replace materials brought from Earth, additional information concerning the composition of the Martian atmosphere and soil was required before a determination could be made of which elements could be used to support the Mars outpost. For example, if future robotic probes discover water or other resources at specific locations on the Martian surface, the Martian outpost may be emplaced at one of these locations. Flight 1 - Unmanned cargo flight: This flight departed LEO in August 2005, on a minimum energy, one-way trip. Upon arrival at Mars, the vehicle aerobraked into a circular orbit and deployed an unmanned semiautonomous rover to the prime landing site region. Over the next several months, the rover explored the immediate region and identified the exact landing site within the prime area. It deployed navigation beacons to assist in landing the primary cargo payload, which landed before the arrival of the crew on flight 2. The primary cargo consisted of the initial surface habitat module and the construction equipment to robotically deploy the habitat. Also included in the surface payload were the necessary power supply and communication equipment. Flight 2 - First piloted flight to Mars: This flight departed LEO in September 2007 on a 500-day round-trip class trajectory, which had the characteristic of approximately a 100-day window of stay time at Mars. Upon arrival at Mars, the piloted vehicle aerobraked into a highly elliptical orbit (250 km x 33,120 km) at an inclination compatible with a range of potential departure declinations. The four crewmembers all descended to the surface for a nominal 30-day stay and conducted local exploration and scientific investigations in unpressurized rovers. One objective of the crew's surface stay was to verify the integrity of the habitat for subsequent crew use. A scientific payload was robotically deployed to Phobos to reconnoiter its resources and to return a sample to the piloted spacecraft for subsequent analysis to verify the use of Phobos as a propellant gateway. A robotic orbiter was also deployed to Deimos for scientific observation. Fight 3 - First human extended duration stay at Mars: A crew of five departed LEO in October 2009 on a 1,000- day-class round-trip mission to Mars. The outbound and return transit times to Earth were minimized to the extent possible, given the propulsive capability of the piloted vehicles. The piloted vehicle aerobraked into a highly elliptical orbit upon arrival at Mars. The crew of five descended to the surface of Mars for approximately 500 days and lived in the habitat facility emplaced and verified by the previous crew. Primary crew objectives were to demonstrate the feasibility of long duration habitation of Mars and to conduct intensive regional science and exploration investigations in the vicinity of the outpost. A manned, pressurized rover was provided for an exploratory trip to scientifically interesting areas. Flight 4: This flight was the second cargo flight, and it completed the emplacement phase. The flight launches to Mars in November 2010 used a non-minimum energy trajectory to take advantage of the Mars launch opportunity that occurred in 2010. The primary payload was the Phobos propellant production plant; therefore, the vehicle aerobraked into a Phobos-compatible orbit, and awaited the crew arriving on the next flight. Additional supplies and equipment were also delivered to Mars on this flight. Flight 5: This flight departed LEO in December 2011 on a 1,000-day-class round-trip to Mars. The vehicle aerobraked into a Phobos-compatible orbit at Mars arrival, since the primary objective of this flight was the emplacement and verification of the Phobos propellant production plant. The crew also conducted global exploration of Phobos before descending to Mars for the remainder of their 18-month stay. Because this mission launched before Flight 3's crew returns, a second piloted vehicle was introduced for this flight. The Phobos propellant production plant was brought to operational status, and the crew verified propellant production and storage; however, the propellant produced was not used until the next flight. Flight 6: This flight concluded the consolidation phase. Launch was in January 2014, and the crew aerobraked to Phobos upon arrival at Mars. Once the Mars transfer vehicle had been refueled for the return trip to Earth, the crew descended to the surface for approximately 500 days. The primary objective of this flight was to expand exploration and science activities on the Mars surface. For this case study, only the first eight flights in the sequence were developed. Flights 7 and 8 began the utilization phase and were launched in tandem during the 2016 Mars launch opportunity. Flight 7 was a cargo flight, carrying in situ resource utilization plants and a constructible habitat capable of housing 12 people. The number of crew for Flight 8 was increased to seven to take advantage of the scientific opportunities allowed by the expanded habitat facilities. Their primary objective was the erection of the constructible habitat. Surface resource utilization and use of Phobos propellant allowed expanded exploration. Trajectories employed for this year's studies fell into two categories grouped by round-trip flight time: (1) 500-day class missions (also known as opposition-class) and (2) 1,000-day class missions (also known as conjunction class). All piloted trans-Mars trajectories were characterized by having a free return capability to Earth - following trans-Mars injection, no propulsive maneuvers were nominally required to return to Earth in the event that the mission was aborted prior to Mars orbit capture. The initial piloted flight was an all-up configuration using a 500-day class trajectory. Later flights used 1,000-day class trajectories. Vehicles were sized to accommodate early flight requirements and then reused to accomplish, to the maximum extent, more aggressive later missions. a. A free-return capability was required for all the piloted Mars trajectories; i.e., the piloted vehicle could return to Earth without any propulsive maneuvers following trans-Mars injection at Earth departure. b. Atmospheric entry velocities (for aerobraking) were limited to 9,500 m/sec at Mars and 13,500 m/sec at Earth. c. Fast transit times (outbound and inbound) consistent with the SRD delta-V budgets were used. Family: Mars Expeditions. Country: USA. Agency: NASA. Bibliography: 1989, 4424, 4425, 4426, 4427.